The purpose of this "cookbook" is to give recipes and examples for how to render caustics with PRMan. 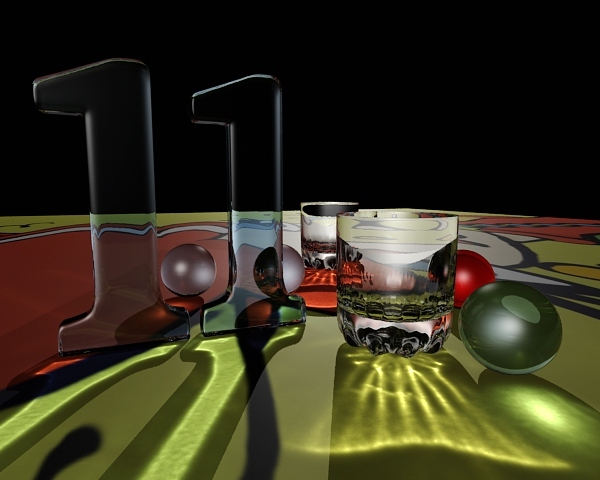 In computer graphics, we use the term caustic to denote light that has been specularly reflected or refracted onto a diffuse surface. Examples of real life caustics are the shimmering waves of light at the bottom of a swimming pool or the heart-shaped reflection inside a coffee-cup. In order to get a caustic effect in PRMan, the scene needs to have both specular and diffuse objects, and the light sources have to be set up such that light from the light sources hit a specular object and is then reflected or refracted onto a diffuse object. Caustics are computed in two passes. In the first pass, photons are emitted from the light sources, traced through the scene, and stored in a caustic photon map. The second pass is rendering, and the caustic photon map is used to compute the caustic color at different shading points. The total number of photons emitted from all light sources is specified by the "emit" parameter to the photon hider. PRMan will automatically analyze the light shaders and determine how large a fraction of the photons should be emitted from each light. Bright lights will emit a larger fraction of the photons than dim lights. If no "causticmap" name is given, no caustic photons will be stored. Usually, a single caustic map should be used for the entire scene, but for special purposes, different objects can have different caustic photon maps. For fast photon emission, it pays off to "guide" the photons as much as possible: if a point light illuminates a scene with a relatively small specular object casting the caustic, it is more efficient to replace the point light (just for the photon generation) with a spot light that only illuminates that small specular object. This avoids emitting a lot of photons from the light source - photons that will never hit the specular caustic generating object. The resulting photon map, causticrefl.cpm, is shown below. Each little dot is a photon. Note that, since photon maps are generated in a separate pass, the scene used for photon map generation can be different from the scene used for rendering. For example, the caustics can be cast from a specular object that isn't even present in the rendering, or the light sources can be different from those used for rendering. Also note that the attributes "trace" "maxspeculardepth" and "trace" "maxdiffusedepth", which are usually used to control maximum ray depths, can also be used to control maximum photon depths. By default, objects are visible to photons. If you wish to make an object invisible to photons, just set the "visibility" "photon" attribute to 0.
sho displays the photon map from the camera viewpoint. For other viewpoints, the interactive application ptviewer is helpful. It is often useful to navigate around the photon map (rotate, zoom, etc.) to gain a better understanding of the photon distribution. Given a caustic photon map, there are several ways that the shaders can add caustic color to the surface color. Here causticmap is the name of the caustic photon map, P is the position at which to estimate the caustic color, N is the normalized surface normal at P, and "estimator" specifies how many photons to use for the caustic estimate. Small values of "estimator" give sharp but noisy caustics, larger values give blurrier but less noisy caustics. Here's a list of frequently encountered problems along with one or more suggestions for how to overcome each. The caustic photon map has no photons in it. Caustics are a specular-to-diffuse effect. So in order to get a caustic, the scene needs to have both specular and diffuse objects. Make sure that the light source illuminates the specular object. Also make sure that the attributes "trace" "maxspeculardepth" and "trace" "maxdiffusedepth" are set sufficiently high for the scene (the default values are 2 and 1, respectively). The caustic photon map has very few photons in it. Did you specify enough emitted photons (the "emit" parameter to the hider)? Values between 100,000 and 1,000,000 are typical. If you specified a large number of photons to be emitted, but only a few of them end up in the caustic photon map, the reason is often that only a small fraction of the emitted photons hit the specular objects. You can help by guiding the photon emission better. For example, turn point lights into spot lights pointing toward the specular objects, and/or narrow the cone of the spot lights so that the cone just covers the specular objects. The picture shows no caustic. First check that the caustic photon map has the right name and actually has photons in it. Make sure that the surface where the caustic should be has a caustic or photonmap shadeop, or that it is illuminated by a caustic light. Also, note that photons from point and spot lights inherently have a square fall-off. So if the lights you use for direct illumination have linear or no fall-off, the caustic can be very dim compared to the direct illumination. Too few photons are used to estimate the caustic. If the photonmap() shadeop is used, increase the "estimator" parameter. If the caustic() shadeop is used, increase the "photon" "estimator" attribute. The caustic is too blurry. Either too many photons are used to estimate the caustic, or there are too few photons in the caustic photon map. To reduce the number of photons used in the caustic estimate, decrease the "estimator" parameter of the photonmap() shadeop, or decrease the "photon" "estimator" attribute if the caustic() shadeop is used. To increase the number of photons in the caustic photon map, either increase the number of emitted photons with the "emit" parameter to the photon hider, or increase the fraction of photons that get stored (for example by reducing the cone angle of spot lights - see item 2 above). There are "polka dots" in the scene. This can for example happen if the intensity of the caustic is set much higher than it should. Essentially, the polka dots are little regions around sparsely scattered photons. Usually the dots from sparse photons are so dim as to be invisible, but if the caustic color is multiplied by some very high multiplier, the dots can become visible. Either reduce the multiplier or increase the "estimator" to smooth the caustics - either will dim the polka dots. Netrender doesn't seem to work with photon tracing. That is correct - netrender does not currently work with photon tracing. But once the photons have been traced, the main rendering can of course be done using netrender. Henrik Wann Jensen. Realistic Image Synthesis using Photon Mapping. A K Peters, 2001. Henrik Wann Jensen, Frank Suykens, Per Christensen, and Toshi Kato. A Practical Guide to Global Illumination using Photon Mapping. SIGGRAPH 2002 Course 43. Information about PRMan's ray tracing functionality (that the photon tracing builds upon) can be found in the Ray-Traced Shading application note. PRMan's global illumination method (that also uses photon maps) is described in the Global Illumination application note.